At the heart of the Tokamak Complex a deep, perfectly cylindrical well is taking shape. 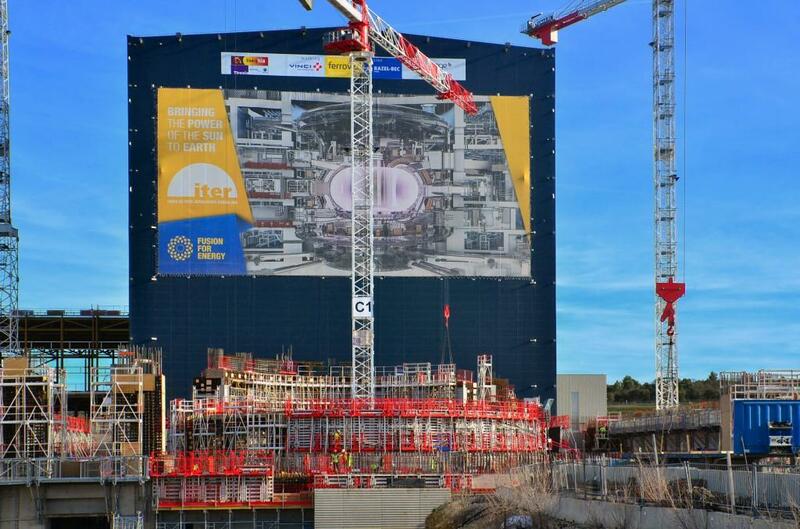 Here, the ITER Tokamak will be assembled from bottom up, enclosed in its stainless steel cryostat and surrounded by the thick concrete walls of the bioshield. 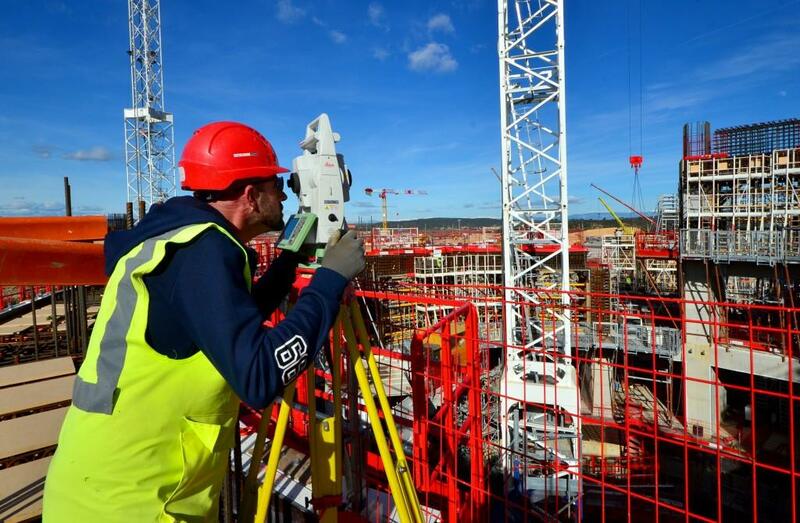 Standing at the L2 level of the bioshield, a worker helps the viewer to judge the scale of the construction work underway at the heart of the Tokamak Building. Newsline takes you this week on a photographic journey into one of the most complex and challenging construction projects in the world. 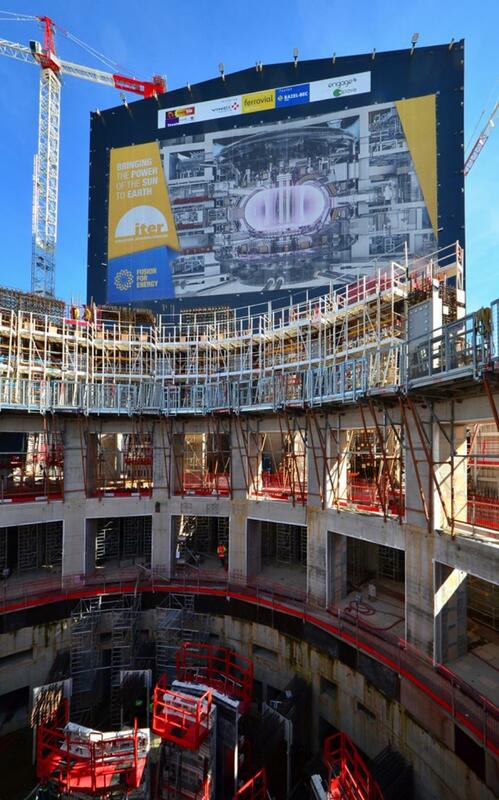 At the centre of the construction site for the Tokamak Complex the bioshield is rising. This reinforced concrete structure (3.2 metres thick at its base) is designed to protect workers and the environment from the radiation generated by the fusion reaction. Having completed the basement levels B2 and B1, workers are now advancing on the "L" levels (above-ground levels). L1 has been poured and is seen still surrounded by scaffolding in this picture; L2 is half framed out; and the first reinforcement bars are visible at the L3 level. The openings in the arena-like bioshield wall are for the cryostat bellows that will connect the machine to the port cells designed to give access to systems such as remote handling, heating and diagnostics. A worker standing in one of the openings (centre) gives an indication of their true size. Already equipped with hundreds of embedded plates, this large area to the north of the Tokamak Complex will host the neutral beam injectors, whose purpose is to deliver a high-energy beam of neutral deuterium atoms to the plasma for heating as well as current drive and current profile control. 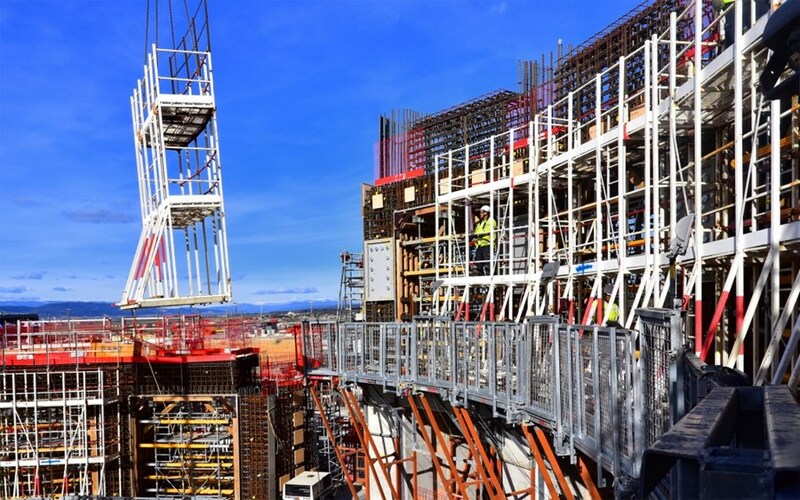 The twin columns rising at the centre of the image are for the portal of the cargo lift shaft — an elevator-like equipment that will handle the activated ITER components and move them from the Tokamak to the Hot Cell Facility during operation. Snow-peaked mountains provide a spectacular backdrop to this worker preparing for a lift operation. The furthest range, to the left, is the Barre des Écrins (alt. 4,100 metres), at a distance of 150 km from the ITER site. The Barre des Écrins was dethroned as the country's highest summit when Savoy—and the 4,800-metre-high Mont-Blanc—was attached to France in 1860. 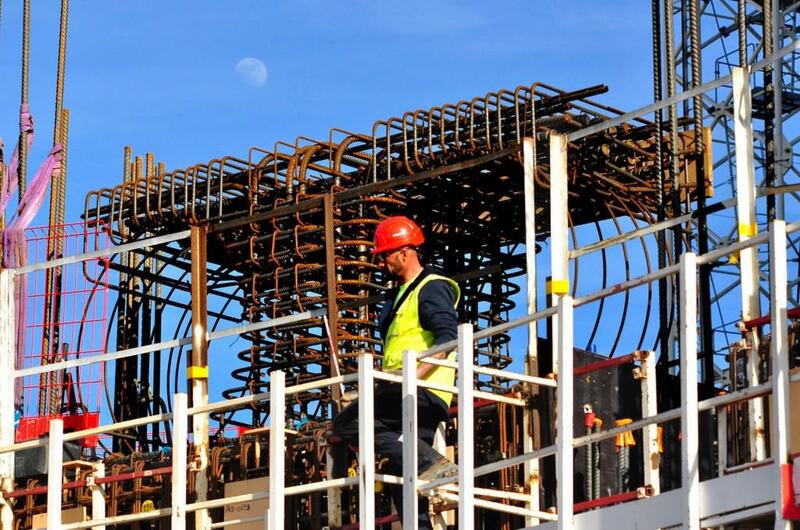 As the moon looks down on the future ITER sun, steel reinforcement is being installed for the L3 level of the ITER bioshield. The partly circular steel rebar will accommodate the magnet feeders that provide connections to the power supplies, the cryogenic plant, and the magnet control and safety units. 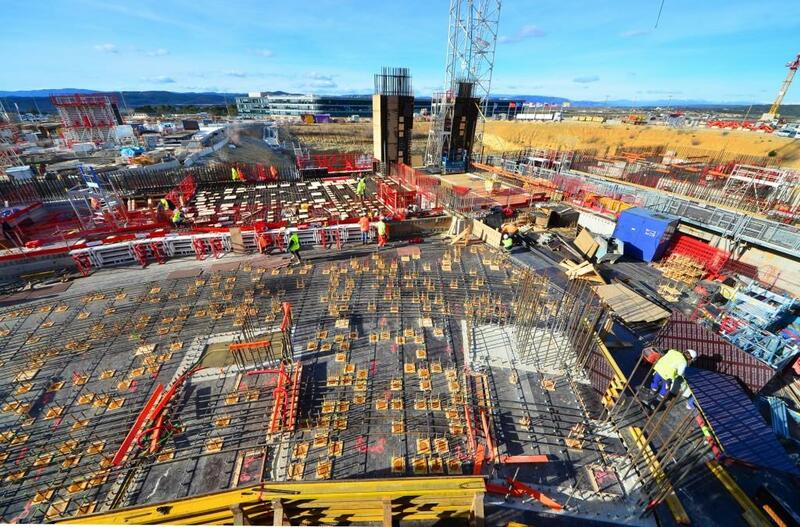 In order to attach equipment such as magnet feeders, cooling water system tanks, diagnostic systems, cryolines, and cable trays, approximately 115,000 steel plates of different sizes and shapes will be embedded into the walls, floors and ceilings of the Tokamak Complex. Each embedded plate must be precisely positioned in accordance with 3D configuration management models. A topological survey prior, during and after installation ensures that tolerances are respected. 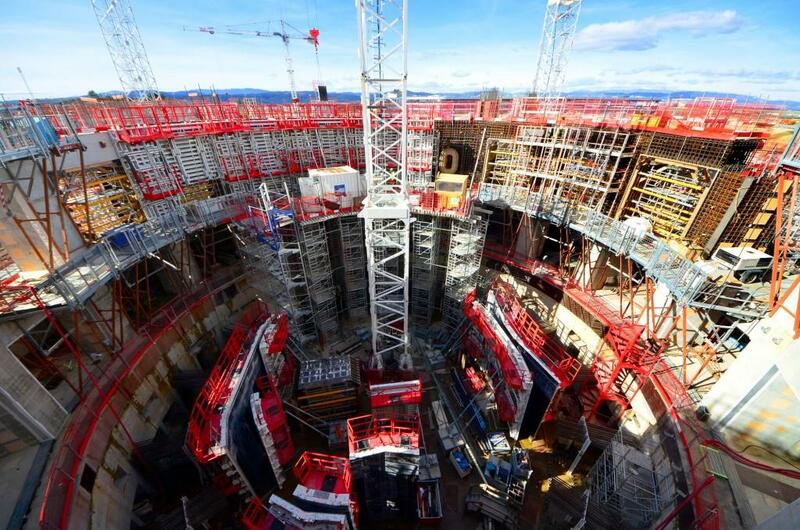 More than 30 metres in diameter, the ITER Tokamak will sit in this deep well surrounded by the bioshield. Formwork on the level underway (L2) will soon be closed to allow for concrete pouring in the coming weeks. The opening visible in the centre is for one of the neutral beam injectors. 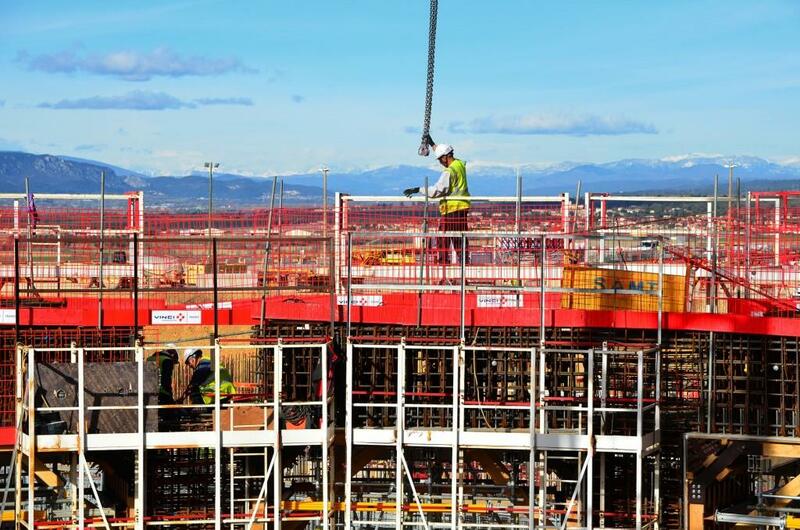 Formwork in this area is particularly complex and challenging as the penetration must connect tangentially with the curvature of the cylindrical bioshield wall.